This year, two lucky grand prize winners will get a 36-month lease of either a 2019 Honda Accord Sport or 2019 Honda Ridgeline RT! 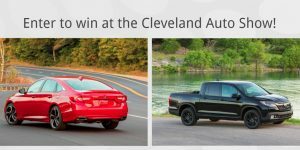 Prizes: There will be two grand prize winners at the Cleveland Auto Show. One winner will receive a thirty-sixmonth lease on a 2019 Honda Ridgeline RT FWD (Approximate value of lease is $17,532). One winner will receive a thirty-six-month lease on a 2019 Accord Sport (Approximate value of lease is $15,048).